From mission teams from the USA that come and serve (thank you to the many on the March team for your service to our Lord Jesus) to those who live on the field with SOS. STORY #1 – We ministered to a schoolboy, who consequently invited his mother and older brother to come to La Esperanza. Through befriending and the preaching of the Word, the mother and brother came to the Lord. 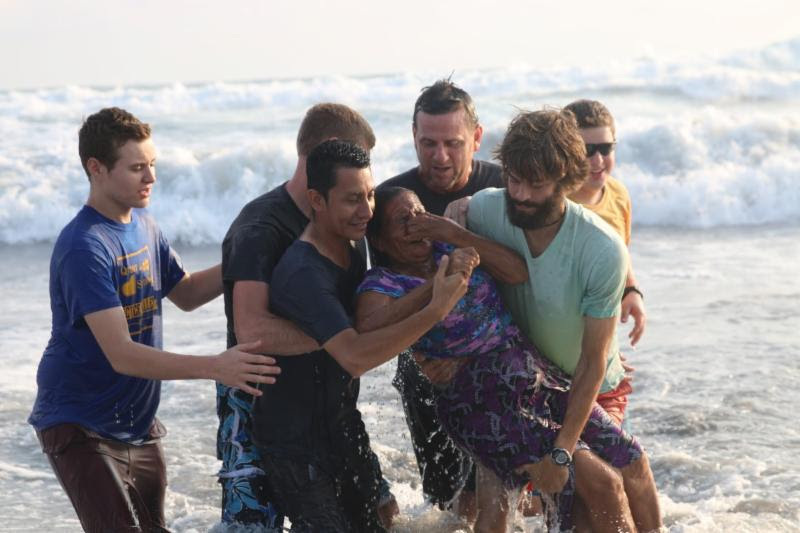 Then, most precious to the SOS team…they were baptized in the ocean. The discipleship is now pressing on with these new ones in Christ. Now that’s what I call baptism by submersion! STORY # 3 – This intriguing narrative was the result of a house visit. Rafael was distant from the Lord, the church and Christians. His wife, Maribel, had come to faith and was faithfully serving the Lord at La Esperanza. So the mission team went to visit and bless them at their very poor hut (that they actually borrow because their too poor to have their own mud hut). The ministry for Rafael’s soul would not just take place at the hut, but the following day. It wasn’t until the baptism/church service that Rafael put his faith and trust in Christ. And then, like a scene out of the New Testament, his immediate confession led to his immediate baptism (consider similar stories…Acts 2:41; 8:38; 16:14-15). Praise the Lord!